Our first production train is in its final build stage and is due to go out on the network – fully approved for passenger service – by the summer. 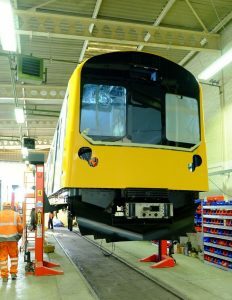 230002 nearing completion in Vivarail’s main workshop. This 2-car train is the first production battery unit in the UK and will be in passenger service by the summer. The train is powered by 2 lithium ion batteries per car (4 in total) and has a range of 40 miles. Battery trains are not new but battery technology is – and Vivarail is leading the way in new and innovative ways to bring them into service. 230002 has a total of 4 battery rafts each with a capacity of 106 kWh and requires an 8 minute charge at each end of the journey. With a 10 minute charge this range is extended to 50 miles and battery technology is developing all the time so these distances will increase. The train can be charged through existing infrastructure – OHL or 3rd rail – and for non-electrified lines Vivarail has developed a static battery bank as an alternative. In each case the train is charged automatically through a patented Automatic Charging Point. This is a simple and elegant design that will allow battery trains to replace diesel units with a minimum of time and effort. This is a fully automated system where the train simply stops at the stop board and connects to the power source without the need for human intervention. The rate of charge is identified by the on-board power electronics and once the charge time is complete or the system detects the driver selecting power the system then shuts down before the train pulls away. The charging point can draw power from existing infrastructure – it simply needs an electrical supply of 11kV or 33kV. However if the supply is not strong enough then a static battery bank can be used instead to provide an energy reserve at the charging points. Vivarail is spearheading this design for the rail industry but it is already used in other applications – such as motorway service area electric car charging. The battery bank charges overnight at a low rate and then discharges through the day to power the trains as necessary. Therefore running costs are reduced because a minimum of electricity is needed during the daytime hours of maximum demand when tariffs are higher. Batteries are no more inherently dangerous to use than any other type of fuel. The lithium ion batteries on our trains work only within defined temperature parameters and performance is constantly monitored – so should an incident occur it can be quickly contained and the gases will be filtered before being allowed to dissipate naturally. Today’s quality and testing methods also mean a longer life for ‘pouch’ modular batteries as well as improved safety. A seven year lifespan is generally accepted as the norm for modern designs and is backed up by a full warranty. 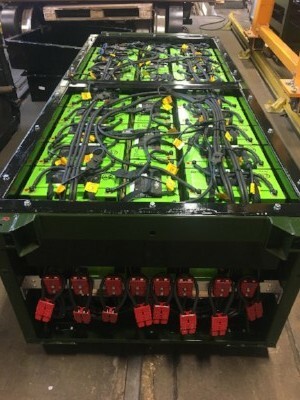 As the leading battery train manufacturer in the UK Vivarail has had extensive industry discussions and is quite comfortable that owners and operators can depend on both the performance and longevity of their batteries. 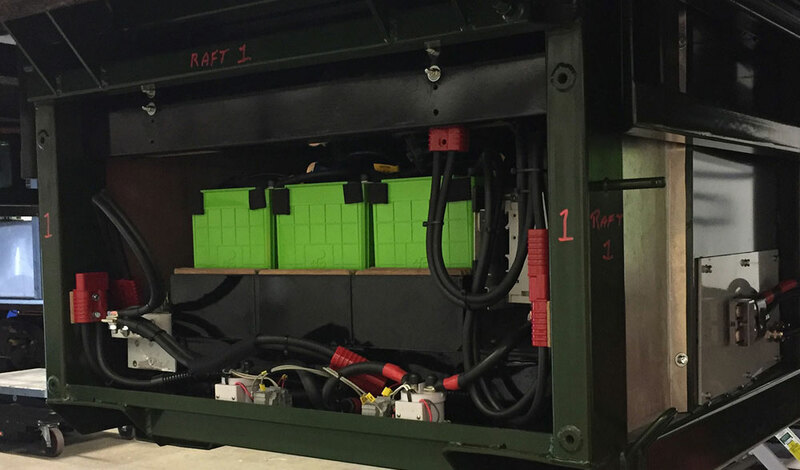 Above is the battery raft which will slot under the train using the same space envelope as a diesel genset. The power packs are simply connected to the train’s high tech electronic systems, the train doesn’t mind what is supplying the power – it just needs 750V to run! In the future fuel cells could replace and/or supplement the batteries – we are investigating this currently and foresee our trains will be running with hydrogen power in the next few years.